Great product. I really am amazed and impressed with this company. They were very patient when assisting me find this item. After consulting with the staff, I ended up going with this bag instead of what I originally thought I wanted. They even sent me samples so I could compare. Thrilled with CEP. I ordered these, some water bottles, and some pens. All arrived on time, as described, and were well received by my clients. This bag is lightweight, durable and extremely versatile. My company does repetitive business with Custom Earth and they never fail to amaze us every time. Such a creative and affordable way to advertise your business. I've ordered numerous times from CEP and I will continue to do so in the future. The process is so simple and you're definitely not alone when working with these guys! I was hosting a huge event in which I needed eco-friendly bags for. I was nervous to place such a big order but I was overjoyed with the result. These bags were exactly what I needed. Outstanding!!! These bags were recommended to us by another company, and they came out amazing!!! The ordering process was so easy, and the imprint came out better than we expected! Very satisfied customer! Our company had a huge convention last week, and we ordered a large amount of bags from CEP. We were so happy when we received the order! The bags were extremely durable and the ordering process made it so easy and stress-free! Would highly recommend to anyone looking for great service and quality! We are so thankful to Custom Earth Promos for capturing the essence of our company on these beautiful bags. You have a customer for life! This was my first time ordering, and I was thrilled with the result. The quality and design were outstanding. We will definitely be ordering again! Ordered these bags as well as some business cards to put in them. They have a great group of people working for them. We've been loyal customers with Custom Earth Promos for years now, and I have to say we have never had a bad experience with this company. They care about their customers feedback and always give the best quality and service. Customers loved how these bags came out!! I was absolutely thrilled with my final order! I highly recommend ordering from Custom Earth Promos. Being that I've placed previous orders with CEP, I was excited about receiving my tote order, which exceeded my expectations. The pricing and quality of the products are amazing. My clientele and I are very pleased. This is the 3rd time I've placed an order. Each time I receive my order I am extremely satisfied with both the product and the customer service. Not only do these bags look good, but I feel good about distributing them to my clients. Knowing that this product is eco-friendly keeps me coming back for more. Out of all the promotional items I offer to my customers, I have never received as much positive feedback as I have with these bags. Thanks CEP! We are beyond thrilled with the bags we recieved. Very excited about the promotional opportunities we can get involved with now! So glad I found this product! These bags are perfect for the trade shows my company is involved in and they are environmentally friendly! I'm a repeat customer of CEP. I have ordered pens, water bottles, and some of their seed paper products in the past. I had never bought any of their bags before, but I felt good about ordering them given the quality of the other products I purchased. The bags were no exception- I was thrilled. High quality products for a low price. I was really happy with the bags and will be a repeat customer. I have a hard time finding eco friendly promotional items, which is very important to me since I run a charity to help the environment. I am very pleased to say CEP exceeded all my expectations and I will definitely order from them again. Second order placed with CEP, very excited about the bags, my clients seem to be loving them! These non-woven reusable promotional totes were a great asset to our marketing campaign. Our company was able to gain great exposure, as well as create an eco-friendly buzz around our business. In addition to the bags, I was really impressed by the customer service and the work of the graphic designer! My third order with CEP and they have yet to provide anything less than great products and great customer service. Thank you!!!! From start to finish, I was impressed with CEP. My clients loved the bags, and I will definitely be doing business with them again. Got exactly what I ordered on time. Couldn't be much happier. I kept a few of the bags that were leftover from my event, and now use them at the grocery store. I'm really impressed with how strong the material is, definitely a winner in my book. Great product at a great price, my clients were thrilled. Really thrilled with the bags! The printed was exceptional. Really impressed with the overall quality and make of the bag. Let us help promote your business or cause while also doing a favor for the environment! The reusable promo tote packs a powerful punch at marketing events such as conventions and trade shows by displaying your logo in a stylish and functional way. 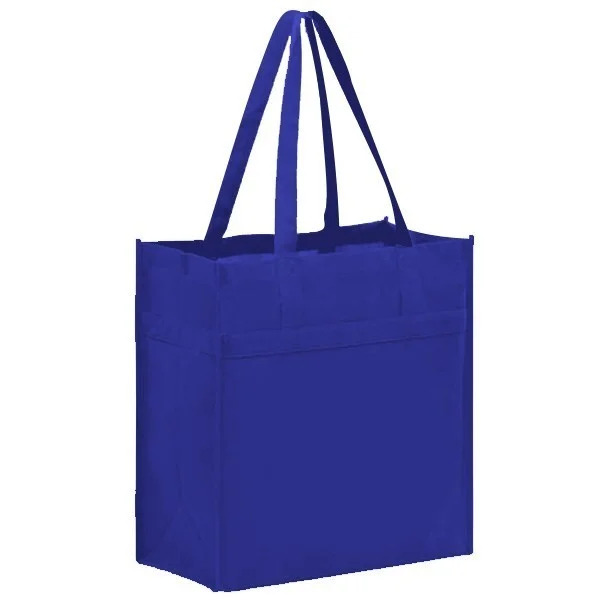 Lightweight, strong, and environmentally-friendly, these non-woven promotional totes are available in-stock in 9 different colors and ready for your logo! Choose from one of over 30 stock ink colors or create your very own shade for a small fee - either way, your next order of custom reusable bags is guaranteed to be a success. Current estimates predict 250-300 bags are disposed annually per person! Set an example at your next event by passing out an eco-friendly reusable bag to gain not only publicity, but also the respect of your colleagues. 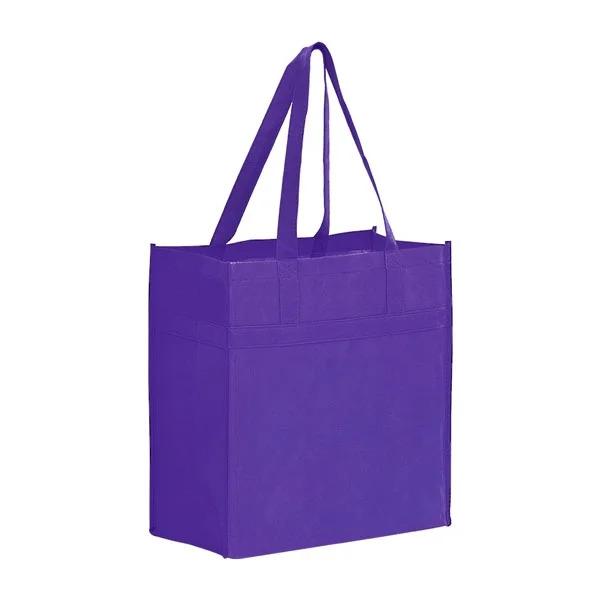 Moreover, the Non-Woven Reusable Promo Totes are exceptional in value and visual appeal. 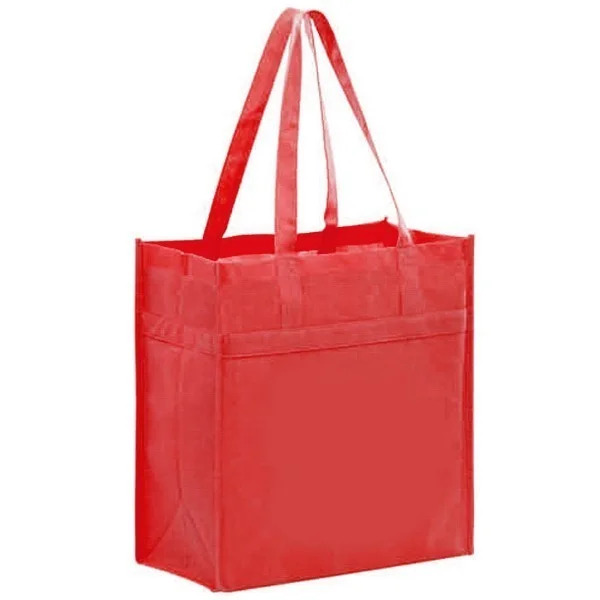 To ensure our reusable grocery bags will stand up after many trips to the market, we've added structural support, including a rigid bottom insert and reinforced handles sewn the entire length of front and back panels. Additionally, the bag's made of 100 GSM non-woven polypropylene, a tear-resistant, water-repellent material. It's a great choice for groceries since it is machine-washable, and naturally resistant to odor and bacteria. Plus, Custom Earth Promos simplifies the customization process. Just upload your logo, clip art, or text to our website and we'll create a FREE virtual image in the bag and imprint colors of your choice - before you even commit to purchase! Fill out a quote request form and one of our friendly, knowledgeable associates will help you design the perfect bag for your needs. Below-wholesale prices are available when you order our non-woven, reusable totes via our custom overseas process! 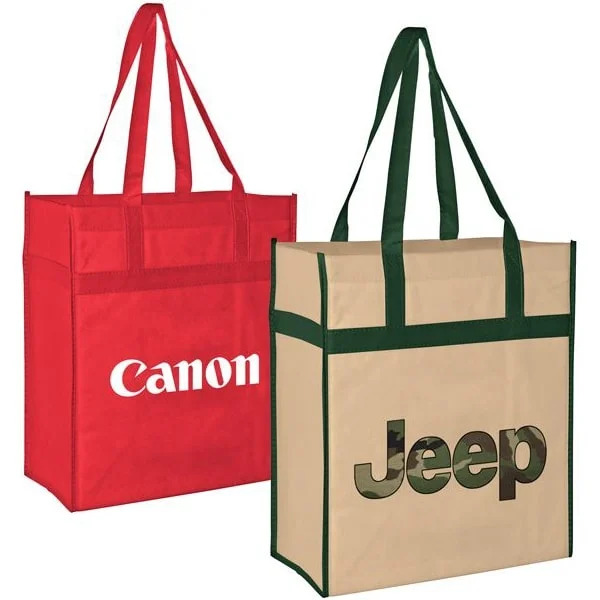 The best cost-to-benefit ratio comes with overseas ordering; our custom reusable bags are made to order from scratch and the low, low price includes the trim and handle color of your choice to perfectly accentuate your logo. Our designers can sew the handles on the inside of the bags, leaving extra space for your brand name. Any surface of the bags can be imprinted, even the handles themselves! Custom Earth Promos offers a number of customization options, such as business card windows, snap or Velcro closure, mesh pockets, water bottle holders, and more.